It was most important that no-one had to take responsibility. That these words were not chosen by any individual, that they just happened to be a certain way, just like a certain mountain range happened to be shaped like a horse or a human head, that they were only the chance fabric of the corporation was tantamount. These words were just any words. Everyone’s shoulders were squarely untainted. Furthermore, no new decisions had to be made. That all decisions were inherent in the mantra, the creation of the corporation already guaranteed the right answer to every situation. That, now, it was only a matter of careful interpretation. Many people have tried to build a time machine. You can buy one off e-bay but it won’t work. I will tell you how to build one that works. Let’s start with Einstein. Einstein said that time is related to space. Therefore a time machine must also be a space machine. Like a space ship or something. Einstein said that as speed increases through space, time slows down. Unfortunately, the effect is relatively minor if you’re going very slow. And even 200 MPH is slow, because Einstein says you need to approach the speed of light in order to make any dent on time. Do you know how fast the speed of light is? Me neither. Light is very very fast. Well, one problem is making a space ship that goes that fast. Another problem is that even if we did make a spaceship that fast, our bodies would not be able to withstand that kind of speed. Think if you went all the way around the world in a fraction of a second. You’d probably be a little dizzy. Also, your body would probably wither away because all your body atoms are banging against all the air atoms until you are no more. This is called friction or air resistance or something. Even in space, there will be things to bang against. Not only is it hard for your body to withstand going so fast, it would be near impossible to build a spaceship out of metal that can withstand that as well. But you know what goes the speed of light? Yes, light does! So let’s build a spaceship out of light. The smallest spaceship in the world. A brand new carbon particle. A mirror. (optional: 2 mirrors). Now we learned in science class that light is both a particle and a wave. Well, what we need to do is catch a light particle while it is a particle instead of a wave. Or catch a light particle while it is a wave and wait till it looks kind of like a particle. Then take your carbon particle and superglue it onto the light particle. We chose a carbon particle because it can be dated. This is called carbon dating, and this way you can tell how old your carbon atom has gotten while going through the time machine. Now what we want to do is go to the end of the universe and place your mirror there. Make sure it’s very very far away, to give your spaceship some time to get there. Now, release your light-particle spaceship in the direction of your mirror. Wait about 100 years, but be ready to catch your light particle when it comes back. Once you’ve caught it, take your superglue anti-dote and pour it on the spaceship. Now the carbon atom should be free. Take it and send it to a lab to be carbon-dated (I don’t know what this means, but a little mystery is sometimes good). If everything works as planned, your carbon atom should have only aged a few minutes. Another option, if you don’t feel like going all the way to the end of the universe, is to place two mirrors close to each other and make sure the light-particle spaceship is bouncing between them over and over again. Let this happen for about 100 years. I hope you enjoyed this science project. (11:35:42 AM) PigeonClubATL: Good morning! (11:35:47 AM) PigeonClubATL: yeah, we are on the hunt for it! (11:36:01 AM) silvergeek000: have you called the police? (11:37:04 AM) PigeonClubATL: they have no been notified, i think it was one of those things that just magically vanish. (11:37:34 AM) PigeonClubATL: maybe it will magically reappear? or maybe the police would just laugh to see the picture of a missing boot. (11:38:29 AM) PigeonClubATL: that is my sentiment as well. (11:39:05 AM) silvergeek000: what park was it headed for? (11:40:28 AM) PigeonClubATL: park hopping promises some fast times. and a lost boot. (11:40:36 AM) silvergeek000: oh… so it was doing a boot tour! (11:41:29 AM) PigeonClubATL: oh that is one way to think about it! what an exciting adventure! (11:43:03 AM) PigeonClubATL: haha they should have it. but they should come home, too. (11:43:19 AM) silvergeek000: at what point did the boot gain full autonomy from your foot? (11:44:38 AM) PigeonClubATL: well, park demand no shoes because breezes and grass need to be felt. so sometimes when you take one off, its difficult to find one. (11:45:38 AM) silvergeek000: a very interesting case indeed. (11:45:54 AM) PigeonClubATL: So where did you stumble upon the lost boot flier? (11:46:37 AM) PigeonClubATL: the posting! How did you come about this screen name? (11:48:03 AM) PigeonClubATL: Where about the city? (11:48:50 AM) PigeonClubATL: well they were lots of places! (11:48:59 AM) PigeonClubATL: we are not messing around about this boot, you know! (11:49:08 AM) silvergeek000: oh no! scattered? if i find it i will definitely return it. (11:49:29 AM) PigeonClubATL: That is much appreciated! (11:49:38 AM) PigeonClubATL: you must not do that! (11:49:48 AM) silvergeek000: why not? (11:49:51 AM) PigeonClubATL: the boot is what we are after! it needs to be returned! (11:49:58 AM) silvergeek000: oh, not the flier? (11:50:15 AM) PigeonClubATL: nono. we are just looking for the boot! 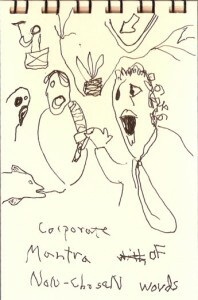 (11:50:25 AM) silvergeek000: you asked me where the flier was! (11:50:35 AM) PigeonClubATL: what would you do with one boot!? (11:52:05 AM) PigeonClubATL: thats just what they’ll do. (11:53:47 AM) PigeonClubATL: oh that quick quip of confusion (kind of like an alliteration?) was kind of funny to look back on. (11:54:49 AM) silvergeek000: if you lost the boot, how were you able to take a photo of it and put it on a flier? obviously you took it before you lost it. But how did you know you needed a photo of it before you even lost it? I think you set this whole thing up! (11:55:37 AM) PigeonClubATL: OR we have the other boot, took that picture and flipped it in Photoshop to represent the missing boot. (11:57:17 AM) silvergeek000: you’re obviously hiding something! 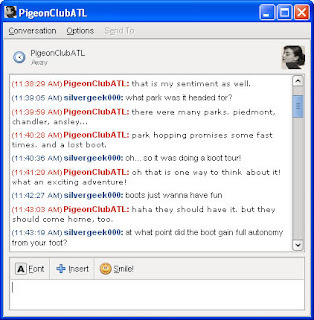 (11:57:22 AM) PigeonClubATL: :0 the boot has everything to do with it! but what is the subject you would like to move to again? (11:57:31 AM) silvergeek000: the missing boot! (11:58:43 AM) PigeonClubATL: that’s what i said! ohhh your tactics will not work on me sir or madam! (11:59:35 AM) silvergeek000: no, you were talking about the other boot, the one that’s not missing! (11:59:40 AM) silvergeek000: sir or madam! 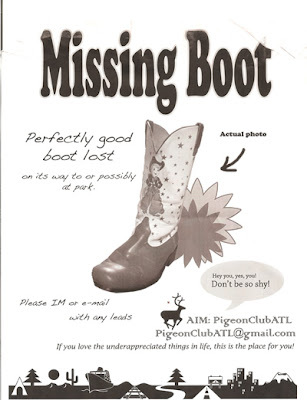 (12:01:11 PM) PigeonClubATL: its a roundabout way of talking about the missing boot. (12:01:20 PM) silvergeek000: an actual photo, yes, but of the non-missing boot! isn’t that irrelevant to the subject at hand, sir or madam? (12:02:16 PM) PigeonClubATL: but sir or madam, boots work in matching and the actual photo is a perfect example of what to look out for, though there should be a right boot and not a left one. (12:02:45 PM) PigeonClubATL: it was the best we could do, we didnt know one boot was going to come up missing! (12:03:14 PM) silvergeek000: i’m afraid we’ll have to start from square one… if i am hearing you correctly, you are saying that the missing boot is identical to the non-missing boot? and so they are almost like… twins? (12:04:58 PM) PigeonClubATL: they are so alike it is frightening, there is one tale tell that they are partners–one is right and the other left. so they must be be reunited. (12:05:53 PM) silvergeek000: strange. i’ve never heard of boot twins! in this case, i don’t see why you are so hell-bent on possessing the missing boot. (12:06:30 PM) PigeonClubATL: because they are a pair! two of a kind! they must be reunited so that they can be together forever! And then my feet can match. (12:07:56 PM) silvergeek000: sir or madam! I beg to differ. You have said in your own words that the boots are identical. And that you already own one of these so-called boots. In this case, would it not be reasonable to let someone else enjoy the other boot? Or do you think that the rich should get richer and the poor poorer!!!?! (12:10:48 PM) PigeonClubATL: nownow, it’s not about acquiring wealth, but it is about wearing a boot. and the problem with items that come in pairs means if one goes missing, everyone is poorer! if, perhaps, you come across this missing boot, sharing could potentially happen and then two people would be richer. (12:10:58 PM) PigeonClubATL: now that is spreading wealth! (12:12:21 PM) silvergeek000: So you only believe in sharing when someone is giving you a boot. Not when you are giving a boot (that you already own 2 of) to someone less fortunate? (12:13:16 PM) PigeonClubATL: but maybe if we can reunite the pair, we can all wear them and share and be happy! perhaps if you find the boot you should return it to its owner so that we may then share the pair with you! (12:13:40 PM) silvergeek000: Preposterous! Sir or madam! (12:14:02 PM) PigeonClubATL: You dont believe in sharing?! (12:14:05 PM) PigeonClubATL: Sir or madam! (12:14:07 PM) silvergeek000: I will have to do a full write-up on your strange ways of thinking immediately. (12:14:21 PM) PigeonClubATL: I will be extremely interested to read such write up! (12:15:36 PM) silvergeek000: perhaps i should say Sirs or Madams? (12:16:00 PM) PigeonClubATL: You are very crafty. And yes, this is a two person endeavor to find the boot. This conversation has been tag-teamed! ha! (12:16:43 PM) PigeonClubATL: but really, this was a two person job. not because one isnt capable, but because two care equally. (12:18:09 PM) PigeonClubATL: honestly, because you seem to be so on the ball with this investigation, i wonder if you could catch the subtleties of change in tone. (12:18:19 PM) silvergeek000: ah… two people… i see why you need two boots now… why didn’t you tell me earlier? one for each person.. you DO believe in sharing afterall! (12:18:46 PM) silvergeek000: oh, but how i wish there were a third boot! (12:19:15 PM) PigeonClubATL: ill share my boot. (12:19:51 PM) silvergeek000: which one of you is the one who looks like a splitting image of audrey hepburn? (12:21:37 PM) PigeonClubATL: maybe there is a collective hepburn aesthetic. (12:22:57 PM) silvergeek000: a last name and a boot to boot! (12:23:46 PM) PigeonClubATL: but katherine, while a wonderful actress, was not quite the face comparable to audrey and it would not be as nice on the bottom of an IM. (12:25:01 PM) PigeonClubATL: haha "a boot to boot"–how often does one get to say something like that? (12:26:17 PM) silvergeek000: "a boot" — that’s how some people say "about"… so if they said "about a boot" they’re saying "a boot a boot"
(12:27:34 PM) PigeonClubATL: I suppose the irish would be very apt to follow this conversation then! (12:28:58 PM) PigeonClubATL: For now, we must be heading out for a bit! We had a lovely time talking to you. (12:28:59 PM) silvergeek000: very well, Sirs or Madams! I am off. but fear not, I will follow this case closely. your boot will be found, although I may end up keeping it. have a jolly day. (12:29:30 PM) PigeonClubATL: Sounds like a plan! Indeed. Perhaps you will find the boot! (12:29:35 PM) PigeonClubATL: and have a nice afternoon! (12:29:41 PM) silvergeek000: you can boot on it! I lied. There will be no more pictures of my roadtrip or of Hong Kong posted here. I did not want to lie. I was forced to. They put me in a bad position, and the little yellow in me got up and wobbled on its knees. I could put pictures up here. It would be easy. But I will not, preferring to stick to my lying ways. I will not back down from this responsibility of lying, I will not deny any longer and on and on that I am indeed a liar. There will be no more hedging around the lie. There will be the lie and nothing else. The lie sits ribald in the center. In the very center of my lie. It is the lie that made me lie about the pictures. I wanted to lie but the lie won’t let me. I have run out of truths to tell and all there is remains. Another thing. I have run out of good lies. There will only be bad lies from here on out, lies that have obviously not been thought over, no research-driven lies, no more fanning the lies until they are bigger lies eating up the pie. There will be dirt and dung and not much more, not even shamefulness. It wasn’t a choice, as I said. They told me to, they told me if I didn’t I would not even have the choice. So I did. I did but now what am I? What does it mean to live within the lie, to be the lie? Is it much different? Is it like a yellowing plant that sits by my window continuing to yellow despite daily nurturing? No. It’s not like that at all. It’s more bumbling and I don’t want you to think there is any malice in the lie. No, not that at all, it is in fact a very innocent lie, one with good intentions only, but even good intentions can be taken to extremes. Even good intentions can leave a man eating lime jell-o in the middle of the courtyard while the head of the tornado bares itself. What I am trying to say is that the intention was there, and it was good intent that placed it there, straight in the path of the lie. The lie didn’t have anything to do with it. The lie was innocent in this good intent, the lie was just minding its own business. The lie would’ve given all it had just to be left alone, about and about. There is a point in time in our lives where we have to ask ourselves what does it mean? How does it feel to be lied to and lied to and lied to. I was lied to once. I was continually lied to. There was a lot of spit involved, and then the process started all over again, organically. It was admirable in that way. It was very deserving of some major Pats. For in this process, the process that drives the process of the lie making machine, it is built — what I am saying is that — it is built on this trust. It is built on trust and encouragement from your peers, a network thus established that can continually support the lie like a flange. In the end what matters is the lie, and here we have it, sitting pretty pleasing, scolded out of its ribboned shell, organically produced and delivered with clipped nails, what you see is not any ordinary person, it’s a manner of speaking, a mode of carrying on, a lurching every few inches away from a truth. What I’m trying to say is that it takes much courage.